Fractures of the proximal humerus are a relatively common problem in the emergency department, representing 5 percent of all fractures. They typically occur in elderly osteoporotic patients via an indirect mechanism, such as a fall on an outstretched hand with the elbow extended. Eighty percent of such fractures can be easily managed by the emergency physician, but the remainder have significant displacement and are a challenge to correctly diagnose and treat. 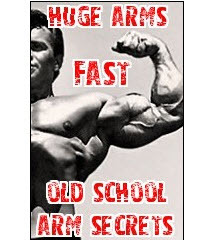 Fortunately, the shoulder joint has an intrinsic reserve of range of motion, which can often provide a surprisingly functional outcome despite seemingly crippling injuries. The proximal humerus is composed of the articular segment, the greater and lesser tuberosities, and the proximal humeral shaft. 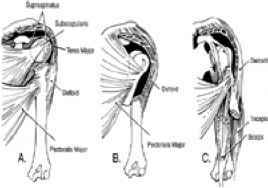 Muscles of the rotator cuff insert on the humeral tuberosities, and the biceps tendon travels between them. The humeral circumflex arteries enter in the area of the bicipital groove and the tuberosities to supply blood flow to the articular segment. Patients with fractures typically present with pain, swelling, and tenderness about the shoulder. Crepitus and ecchymosis may be present, and the arm is generally held closely against the chest wall. A neurovascular examination should be performed, since the brachial plexus and axillary arteries are near the coracoid process and not uncommonly injured. The axillary nerve is the most commonly injured nerve, and sensation over the skin of the deltoid muscle should be tested routinely. Injury to the axillary artery is the commonest vascular injury and may be suggested by paresthesias, pallor, pulselessness, or an expanding hematoma. Vascular injuries may occur with even trivial trauma in atherosclerotic elderly patients. Radiographs consisting of anteroposterior, lateral shoulder, and axillary views will correctly diagnose most proximal humerus fractures. Fractures of the articular surface may be suggested by a fat fluid level or by a superior joint hematoma that appears to push the humerus downward in the joint as a "pseudosubluxation." A transthoracic lateral radiograph, tomograms, CT scan, and magnetic resonance imaging scan may also be of value. The Neer classification system uses the relationship of the proximal humerus segments (greater and lesser tuberosities, anatomic neck, and surgical neck) to guide the management of these fractures. Significant fragment displacement is defined as greater than 1-cm separation or greater than 45° of angulation between fragments. The number of fracture fragments significantly displaced determines the classification in the Neer system ( Fig 263-10). FIG. 263-10. 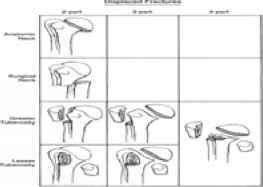 The Neer classification system for proximal humerus fractures. A one-part fracture may have any number of fracture lines, but no major segment is significantly displaced. The surrounding soft tissue and periosteum hold fracture fragments together. One-part fractures comprise over 80 percent of all proximal humerus fractures. Treatment generally consists of immobilization with a sling and swathe or collar and cuff, ice, analgesics, and referral. Early exercise is important to avoid adhesive capsulitis. The overall prognosis is generally good. Two-part fractures account for 10 percent of proximal humerus fractures, with the remaining 10 percent evenly split between three-part and four-part fractures. Such displaced fractures are more frequently associated with complications and are often difficult to manage. Treatment considerations include integrity of the blood supply, integrity of the rotator cuff, likelihood of union, associated dislocations and neurovascular injuries, and the functionality of the patient. Closed reduction, intraoperative treatment, or a combination of the two may be necessary. Emergent orthopedic consultation for multipart fractures facilitates subsequent reduction and referral. Any fracture involving the anatomic neck or the articular surface may result in compromise of the blood supply to the articular segment. Ischemic necrosis of the articular segment may ultimately require insertion of a humeral head prosthesis for these relatively uncommon fractures. Greater tuberosity fractures accompany up to 15 percent of anterior shoulder dislocations. Significant displacement of a greater tuberosity fragment implies a concomitant rotator cuff tear, with surgical repair often necessary for the active patient. Fracture of the lesser tuberosity should alert the examiner to a potential posterior shoulder dislocation. Significantly angulated surgical neck fractures are at risk for neurovascular damage (axillary neurovascular structures and brachial plexus) and should be immediately immobilized and radiographed in the position of presentation. Children may have significant displacement or separation of the proximal humeral epiphysis and may require exact reduction if near skeletal maturity. A shoulder spica is often used after reduction. Fractures of the humeral shaft occur in a bimodal age distribution, with peaks in the third and seventh decades of life, representing active young men and osteoporotic elderly women, respectively. The most common site of fracture is the middle third. Neurovascular injuries are a common complication of these fractures and are a direct result of the anatomy of the upper extremity. Displacement of fracture fragments is common as a result of the insertions and actions of the various muscles (deltoid, biceps, triceps, supraspinatus, and pectoralis major) that act on the upper arm ( Fig 263:11). FIG. 263-11. The actions of the muscles inserting on the humeral shaft determine fracture angulation and displacement. Humeral fractures anterior view: A. Angulation of fragments with fracture line distal to rotator cuff insertion. B. Angulation of fragments with fracture line distal to pectoralis major insertion. C. Angulation of fragments with fracture line distal to deltoid insertion. Humeral shaft fractures may be caused by a direct blow that produces a bending force, which results in a transverse fracture. It may also be caused by an indirect mechanism, such as a fall on the outstretched hand that produces a torsion force, resulting in a spiral fracture. A combination of bending and torsion forces results in an oblique fracture, sometimes with comminution, producing the "butterfly" fragment. The humerus is also a common site of pathologic fractures, especially from metastatic breast cancer. Clinical examination reveals localized tenderness, swelling, pain, and abnormal mobility or crepitus on palpation. Displaced fractures are associated with shortening of the upper extremity. Attention must be given to the initial neurovascular status, and reevaluation must be performed, especially after manipulation. Radiographs should include two views of the humerus, and consideration should be given to radiographic examination of the shoulder and elbow as well. The vast majority of closed fractures of the shaft of the humerus are managed nonoperatively. The treatment of uncomplicated fractures includes immobilization, ice, analgesia, and referral. Closed treatment options include the coaptation splint (sugar tong), a hanging cast, functional bracing, and external fixation. A simple sling and swathe are adequate for most emergency management. Some surgeons favor internal fixation for patients with transverse fracture lines, very proximal or very distal humerus fractures, pathologic fractures, multiple trauma, and fractures associated with neurovascular injuries. Complications include injury to the brachial artery or vein, or the radial, ulnar, or median nerves. A radial nerve injury, which is the most common, may be manifested by a wrist drop and altered sensation at the dorsal first web space. The incidence of radial nerve palsy ranges from 10 to 20 percent. Fractures of the distal third are particularly prone to entrapment of the radial nerve either as a result of the initial injury or after closed reduction. The majority of patients have eventual return of nerve function without operative intervention.